The New Zealand Women are set to host the Indian Women for the second T20I at Eden Park, Auckland. Indian Women would be aiming to bounce back in this crucial contest. For the visitors, it’s a must-win match as they look to tie the three-match series. After the ODI series triumph by 4-1, this was a reality check for the Blue Brigade. The White Ferns emerged victorious in the first encounter by 23 runs to take a lead of 1-0 in the series. Having won the toss, Team India decided to ball first which backfired as they ended up losing the opening match in Wellington. The home side posted a par score of 159 runs on the board, courtesy Sophie Devine’s fireworks top of the order. She scored 62 (48) while building a crucial partnership with the skipper Amy Satterthwaite 33 (27) to take her side to a decent total. India started the chase brilliantly and they looked in total command till the halfway line. In the process, Smriti Mandhana scored the fastest T20I fifty in Women’s cricket in just 24 balls. Her heroics went in vain as India failed to capitalize on the perfect start. At one stage India were cruising at 102-1 on the board in just 14 overs. 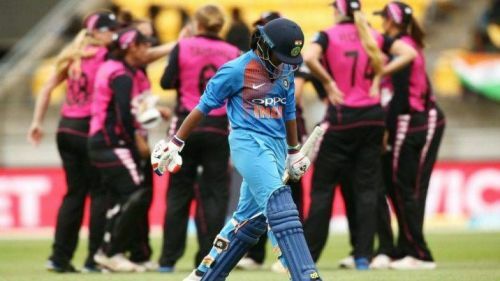 The visitors required 49 runs in 36 balls and the Indian batswomen looked well in control to take their side over the line but the inexperienced middle-order collapsed once again. India lost 9 wickets for 34 runs and were bundled out for 136 runs in 19.1 overs. Team India needs to address their weaknesses heading into this must-win match. Mithali Raj might be brought back into the side to strengthen their middle-order. The hosts, meanwhile, would be hoping for the same kind of clinical performance to seal the series in the second match itself. Date: Friday, February 8, 2019.